The Showa Era (1926~1989) encompassed a period that started with the Japanese emerging as a major force in international political and cultural circles, through contentious years of confrontation between the East and West that resulted in World War II, then capitulation, a decade of hardship and privation, and finally renewal sparked by the vigor of the Japanese work force which marshalled its strength to prove its worth. It is not my place to argue right and wrong here. I merely wish to set the stage for the memorable work that is to follow. I am translating an essay regarding one of the finest games ever played in the history of go, which involved not two, but three players! 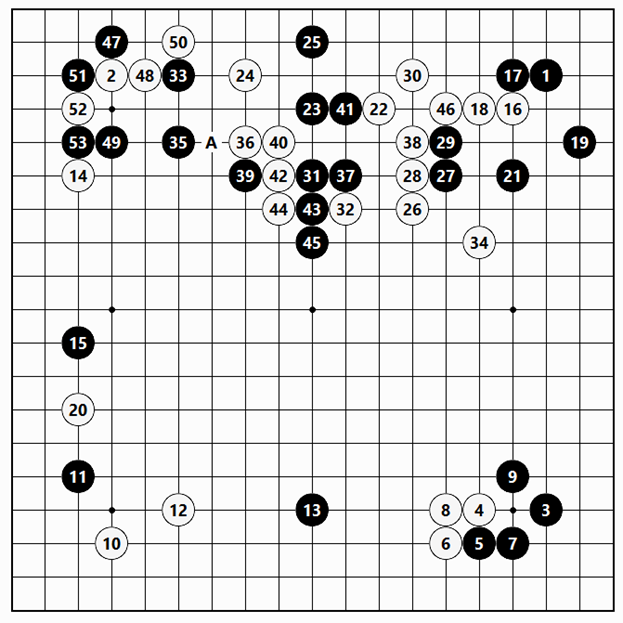 Sitting at the go board were the legendary Go Seigen, considered by many to be the greatest go player who ever lived, and an upstart, Sakata Eio, who had been the only one to have bested Go Seigen in a match among all of the top Japanese professionals. This game was played to settle the question of supremacy. After an exhaustive tournament was held to decide the best player in the world, a tie among the leaders would require a play-off. Whoever won that play-off would be the Meijin. …and similar stipulations were part of the agreement. Of course, after the three corporations came to this agreement, it became practically one in name only, and strong enforcement power was lost. Leaving this problem aside, even if a Meijin Tournament project was launched, there was a question whether the requisite funds for it could be raised. And supposing that one corporation signed a contract, in the worst case scenario, it was worried how the other two corporations would react. Besides that, how would the circumstances of the Kansai Ki-in [Western Japan — based in Osaka — Go Association, led by Hashimoto Utaro and home of the up-and-coming Hashimoto Shoji] be affected? Furthermore, other than the Yomiuri [which had sponsored Go Seigen’s best of ten jubango matches], but especially the Asahi, were concerned about whether Go Seigen would participate. The situation was such that none could guess how a resolution would be reached. During that period, the Nihon Ki-in was facing a financial crisis. Many professional go players were fretful and impatient to see something done to deal with it. 1962: Fujisawa Shuko had half given up on possession of the Meijin title. In 1960, in conjunction with the Professional Go Players Directors Election, Fujisawa Shuko had the support of many. “Being Shuko san, somehow he will make it,” was the expectation among young professional players. For Fujisawa himself, from long ago he had harbored in his heart the conception of a Meijin Tournament. “It happens that he took the Asahi [sponsored] Saikoi [Top Position — title] last year, which it seems was around the end of February. When he went to the Asahi Newspaper to offer his salutations, the managing director at the time, Shinobu san, met with him, and they discussed the Meijin Tournament project. Following that, once again discussions were engaged concerning the Meijin Tournament. On that day, I resigned from my position. I was a director [of the Nihon Ki-in] at the time, and the player in charge of the Publicity Department was Murashima [Yoshinori] 7 dan. For a long time, he had been director of the Publicity Department, so I had to discuss things directly with him. And yet, still the talk did not reach the concrete stage, and things were left at that. ‘One of those among them had insisted that if a newspaper laid out “this and this,” everything would be settled and the tournament would be launched right away. A projection of expenses had even been drawn up, concretely estimating what would be needed, and this was circulated among professional players. Then, other than the Yomiuri, this project was presented to the other newspaper corporations, but they considered it difficult to move forward with it. Go Seigen san was associated with the Yomiuri, so starting with that, it was desirable for the Yomiuri Newspaper to devote the needed resources to the Meijin Tournament. That was the conclusion reached. ‘In my humble opinion, it was best to resolve on that. And yet, this followed on the heels of the best of 10 game match jubango era that centered around Go Seigen and the Japan Strongest Player Tournament [Nihon Saikyo-Sen; 1957~1960, sponsored by the Yomiuri Newspaper], and this would snuff out that history. [How true does this appear today? Does the reader know any of this history, as opposed to the Kisei Tournament sponsored by the Yomiuri now and the Meijin Tournament by the Asahi?] While the pupil of my eye was black [a proverbial saying in Japanese], I fervently hoped secretly that somehow or other the Yomiuri Newspaper would launch this Meijin Tournament. ‘However, wait a minute [another common Japanese expression = “Matte yo”]. In actuality, the realization of the Meijin Tournament required time, and more than that, money. That was something that could not easily be worked out. It needed careful consideration from first to last. ‘So I immediately inquired as to what would actually be required to bring this to fruition. The answer that I received was, “Every ounce of strength needs to be exerted.” I then asked someone else the same question. The answer was the same. At that time, the eyes of the people I had questioned were shining brightly. But despite those shining eyes, I knew deep in my heart what a tremendously difficult undertaking this would be. That was because amid their declarations that, “This will absolutely come to pass,” there was nothing “absolute” about it. ‘This group of professional players would surely devote all their strength as they had said. However, it was possible that even exerting all their strength would not be enough to successfully see this through. When they could not do it, they could only say, “We are very sorry” [Domo sumimasen], and leave it at that. But I could not leave it at that, and that weighed heavily on my mind. Even if the insiders at the Nihon Ki-in worked in concert, it would not be easy. There was also the problem of whether the outsiders there would add their strength to act in support. This situation even now leaves a bad taste in my mouth. I really had no confidence that even if twice the amount of money that had been projected to be needed was raised, it was not reasonable for me to bring the plan to the management of the [newspaper] corporation. ‘With all of this, a cloud of gloom descended on me. That was because I thought that although many wanted to do this, it could not be done. Continually urging people on by saying “Isn’t it time? Isn’t it time?” would inevitably be answered by, “Hmm, wait a minute,” and I did not want these people of good will to end up disappointed. Fukumenshi was completely unsuccessful in his efforts, so Fujisawa took it upon himself to approach the Asahi with the proposal. However, when the challenge for the Honinbo title ended for Fujisawa [in 1960], due to internal circumstances at the Asahi corporation, suddenly Director Shinobu ended up resigning. Because of that, the talks which had been proceeding at a steady pace broke down. Negotiations went back to square one. After becoming director in charge of the Public Relations Department, he renewed negotiations with the section chief of the Miyamoto establishment. Things proceeded to the stage where Fujisawa passed along a copy of the business plan for the project. The business plan was presented to the board of directors, where it came under discussion several times. But in the end, the Meijin Tournament could not be held for the amount of money that the Asahi calculated. That decision was reached and formally given in response. Fujisawa, after consulting with the board of directors, in turn went to the Yomiuri. That was at the beginning of September. “At last he has come,” thought Fukumenshi. As for Fukumenshi himself, he just stood to one side with his arms folded, not paying attention to what was happening. The corporation made certain that this one stipulation was made. The fruit had reached the peak of ripeness. It naturally fell from the tree as in real life. And yet, gathering it up would be difficult. Fukumenshi’s real, strenuous work started at this point. Before talks began with management, alone he once more slowly reassessed whether, after all, this could come into reality or not. First, the agreement among the three [newspaper] corporations was a concern. The three corporations’ agreement covered the Asahi’s sponsorship of the Top Position Tournament [Saiko-I-sen], the Yomiuri’s controlled the Six Strongest Tournament [Rokkyo-sen], which had become unrivalled in its fame. Although both the Top Position Tournament and the Six Strongest Tournament were under its aegis, they were separately administered. On that occasion, there were objections, but there was nothing vociferous about them. Rather, the vital point regarding coming to an agreement about the Meijin Tournament had now truly been reached. The agreement acted as a shield against the worries about whatever objections might be raised. Eventually, a conclusion was arrived at. The Asahi turned down the Meijin Tournament, not because of the agreement among the three corporations, but because an understanding about the amount of money required could not be reached. Had that been possible, the Asahi was all for it. The agreement among the three corporations was already viewed as null and void. 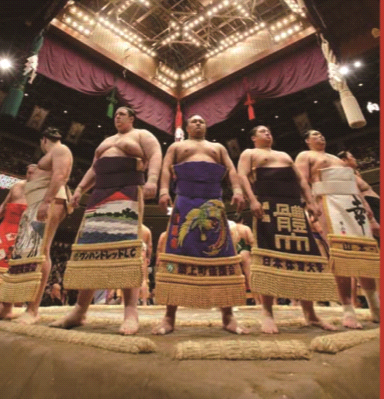 In addition, during the negotiations the Mainichi told Chief Director of the Nihon Ki-in Arimitsu Jiro that things such as the conventional system proposed to be used for the Meijin Tournament was valid and it had no disagreements. Considering this, Fukumenshi came to a resolution and sprang into action. 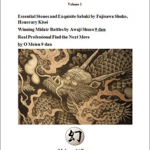 Reading “Reflections on the Meijin Tournament,” Fukumenshi’s hard work and resolution can be perceived to be above normal. “…Leaving aside the question of whether it is possible or not, the top priority is to have the management of the Yomiuri listen to this. 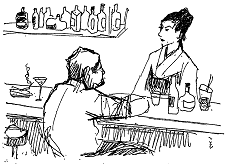 The second priority is to have the Nihon Ki-in make the arrangements once the management is in agreement. If the Nihon Ki-in can make the arrangements, then the next step in the process will be to pursue matters with the Kansai Ki-in. The first barrier in the case of the top priority in the process was the head of the Cultural Department. 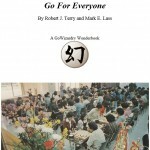 “Fortunately, Director of the Cultural Department Akasawa understood what go is all about. However, those in the Cultural Department over all who wielded the necessary influence adhered to the general policy that in the balance of things a large amount of money could not be devoted to go. This was a considerable barrier to surmount. But I believed that it would be all right to take that barrier head on and smash it. In the end, I gave my advice to do that, and it was immediately smashed. Just as my theory predicted. So I went ahead and actually entered it into the budget. “This Department Chief Akasawa was a former colleague of mine and in person he could be brusque, but he possessed a warm spirit of fellowship. In the past, Vice President Anda would often get irritable and chew me out. Concerning that, one time I was called out on the carpet. Outside of the corporation, I was seen playing go and told, ‘Anda san called and if you do not come back to the office quickly, it’s your neck!’ [Idiomatic in Japanese = kubi ni naru = be fired from a job] The person who helped me keep my neck attached to my body was this young Akasawa. (Of course, for a time it was touch and go, but the announcement [in the newspaper] on that day was great. That was how I saved my skin.) Consequently, this can be seen as a once in a lifetime preservation of my neck, when my foolishly immature action [in bringing the Meijin Tournament project directly to management] was forgiven. I truly believe that. 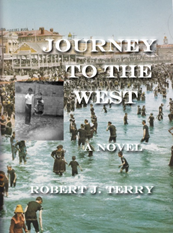 “In this way, I proceeded to deal with the second barrier. I spoke right away to Editorial Bureau Chief Kojima. This barrier was practically insurmountable. It was getting down to the final stretch. If things could not be resolved, that would be the end. “But from the time that Kojima san was the department head long ago, he kindly helped me on many occasions. Although he also often pointed out mistakes that I made and scolded me severely. “This is what has to be done!” were words of his that generally touched on a key factor. This time his words, “This is what has to be done!” were of the greatest importance. “Consequently, I might be a terrible speaker, but my heart and soul were in this project because the Meijin Tournament would energize the go world. Now was the best chance that had come along. And so I told the [Yomiuri Newspaper] company things like it would not incur a loss [in sponsoring the tournament]. However, an assenting nod was not forthcoming. Again, I had thrown myself into a project and been smashed. Black plays 1 at the 3-3 point. Around three years previously Sakata 9 dan had loved to play at the 3-3 point, and this had led to a boom in the go world [that led many players to imitate Sakata]. Up to then, for the most part it was White that played at the 3-3 point, but then many players holding Black started playing the 3-3 point often. 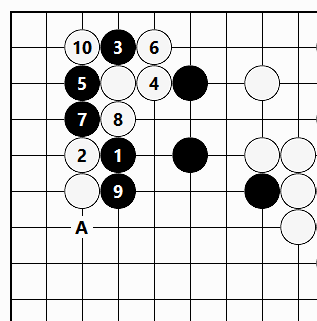 White 4, immediately attacking the corner to prevent Black from making a corner enclosure there, was an unusual ploy on the part of Go 9 dan. This may be construed as a move that shows the extraordinary force of will [iyoku] brought to this game. When Black plays 19, White ignores the move to invade at 20, seeking to find out how Black will respond. However, Black continues with the knight’s move at 21. Both players try to frustrate their opponent’s aims. It seems that fireworks will soon explode. 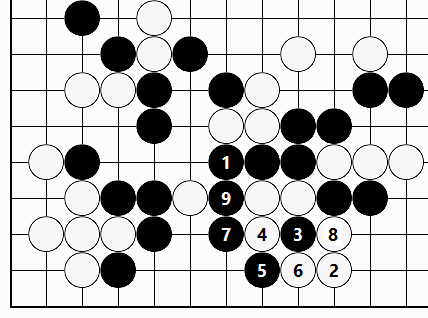 Using White 26 to attach at the point to the left of 21 would solidify Black’s right side, so White instead played in a way designed to be light. Black 31 is another good jump that intends to attack White’s group in the upper right. At the same time, White attempts to attack Black’s three stones [23, 25 and 31] while doing the utmost to neutralize Black’s territorial framework [moyo] on the right side. Black 35 (27 minutes) was a little greedy, so the impetus of the board position impels White to jump to 36, leading to a complex and difficult fight. It seems that it was better for Black to play the move of 41 as the connection at 42. It then would be standard for White to make the attachment below at 50 to connect [the stones on the left to the right]. Black A, White 48 and Black 46 would follow. …Black makes the shoulder hit of 1 to go into action. In that case, White replies with 2 and as might be expected Black 3 follows, with White probably tenaciously answering at 4. The sequence through White 10 gives White large profit in the corner. Black in return gets to make the hane at A for a thick and strong position. 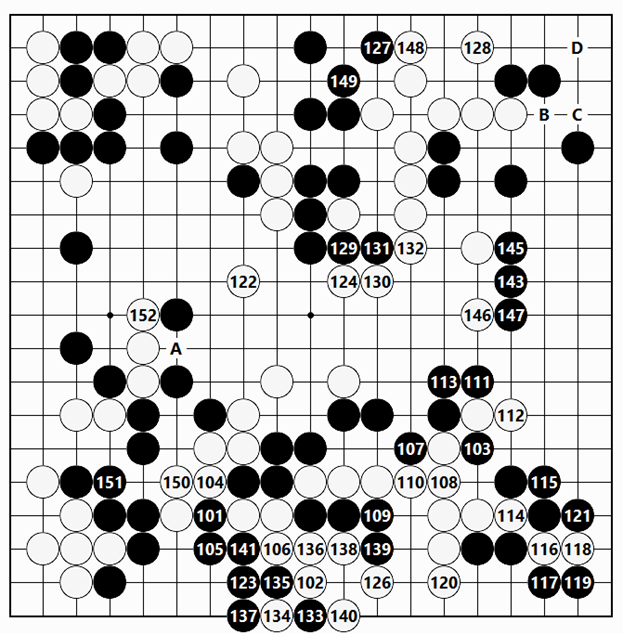 Therefore, Sakata 9 dan had no confidence in this variation and diverted with the play in the figure. …he also thought about playing the diagonal move of Black 1. The sequence through Black 9 can be expected, upon which the unpleasantness of incurring the peep of White A forced him to abandon the idea. In response to Black 67, the mild drawing-back move of White 69 would have left things simple and easy for Black after Black makes the descending move at 68. From White 76, the knight’s move of 78 (12 minutes) separates Black’s groups on the upper and lower sides in order to attack. On Black’s part as well, White’s thinness on the lower side, to the left and right was focused on for attacking. The game is at last reaching the climax. White attaches at 82 so that if Black hanes at B in response, White’s extending at C would have an effect on Black’s group on the upper side. Black 93 (16 minutes) is the quintessential Sakata 9 dan sparkling move [in the boxed set of Sakata’s games, he points out much the same thing about this move], which displays the sharp kind of tesuji that he plays. At the time that this move was played, Fujisawa Hosai 9 dan on the side of the board wondered, “Could the game recorder have made a mistake about where this move was played?” Instead of 93, the usual idea would be to block at 96 to threaten White’s eye space to control the action. In answer to 93, should White play atari at D, Black E would be another good tesuji. 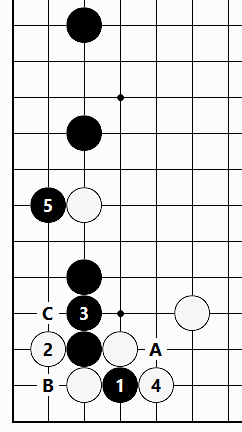 If White then replied at B, Black E, White F and Black’s extending at G would make Black’s position thick and strong, which would be good. In addition, should White use D to connect at H, Black would have the fencing-in move of I available, which would also be promising for Black. For 95, blocking at 96 would be met by White 95, Black J and White D, which leaves the possibility of a wedging-in move of White K available, so Black is badly off. Black pushes in with 97 and leaves things at that to connect above at 99, but if this move was played at the connection below at 100, White 99 would be a natural cut. After that, Black L would be answered by White M, a block that is now feasible. Should Black cut at N, incurring White’s pushing through at O would put Black on the spot. …pushing through with 1 was better. If White answers at 2, Black gets thick and strong with the squeezing sequence through 9, and the resulting position is playable for Black. This settles White’s group on the lower side. For Black, too, the sequence through 13 is thick and strong, letting Black make a considerable amount of territory on the right side. The remaining questions concern the Black group on the upper side and White’s position in the middle of the lower side. White 22 presses in on the Black group on the upper side while giving support to the White stones in the middle of the lower side. 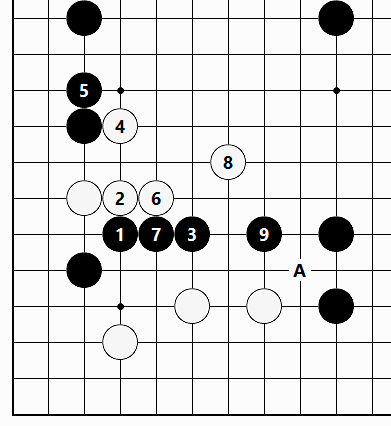 Here, Sakata 9 dan played Black 23, intending this as a forcing move, so that following some sort of response by White, Black had the intention of connecting securely at A, preventing the two White stones here from moving out. Without a doubt, this would have established Black’s advantage in the game. However, Go 9 dan spent 29 minutes in agonizingly intense thought, after which he left the position on the lower side as it was to head to the upper side to attack Black with 24. This left a playing method to create a ko on the lower side. This was a big ko that involved the life or death of White’s large group of stones there. Go 9 dan’s conclusion after analyzing the whole board position was that meekly replying to Black’s moves would lead to a slow deepening of the disadvantage in the game. There is no doubt that the intention was to tenaciously fight the ko on the lower side while attacking Black on the upper side. 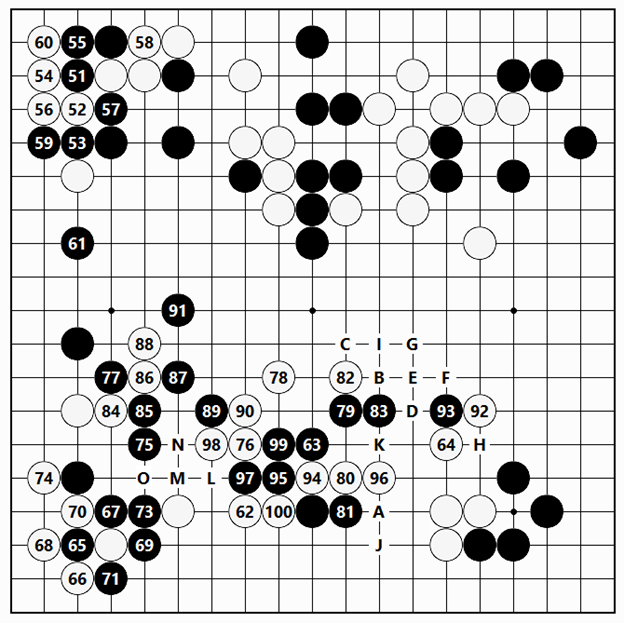 The ko threat of Black 43 was ignored by Go 9 dan as unavoidable and White connected at 44, ending the ko. There was no other option. Next, Black 45 consolidates a large amount of territory on the right side. This also eliminated unpleasantness in the upper right corner (White B, Black C and White D). With this, to a certain extent the general outlook in the game has been decided. Just one thing, the disadvantage that Sakata 9 dan faced was a shortage of time on the clock, only 8 minutes. In comparison, Go 9 dan had almost 4 hours left. Go 9 dan had absolutely not given up on the game. From this point on, he devoted time, move by move, to try to grasp a chance to recover in the game. It is instructive to study Go 9 dan’s painstaking play around the board in that quest. At long last, Go 9 dan reached for his final aim, White 52, pulling two stones out of Black’s clutches. Starting with this, the groundwork was laid to take the good opportunity to make the diagonal attachment of White 72. The question was whether the life or death of Black’s group on the upper side would hang in the balance. 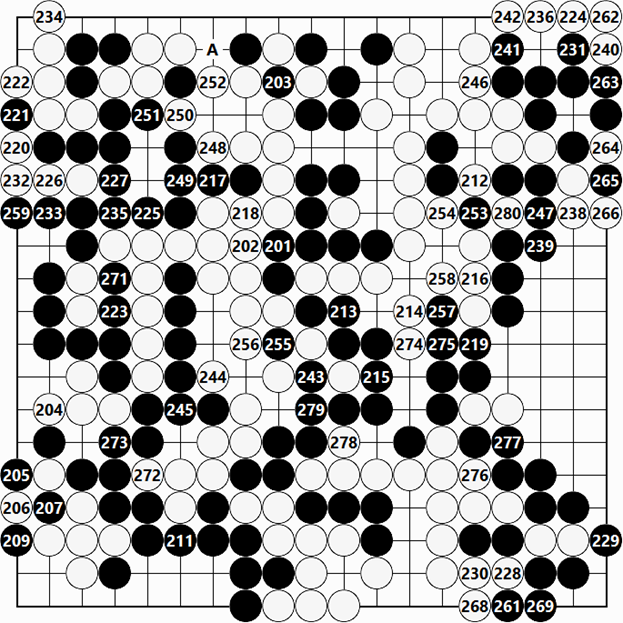 Should Black use 73 to push through at 74, it would be met by White making the empty triangle shape with a move at 73. Then, Black A, White B, Black C and White D would make life for the Black group questionable. 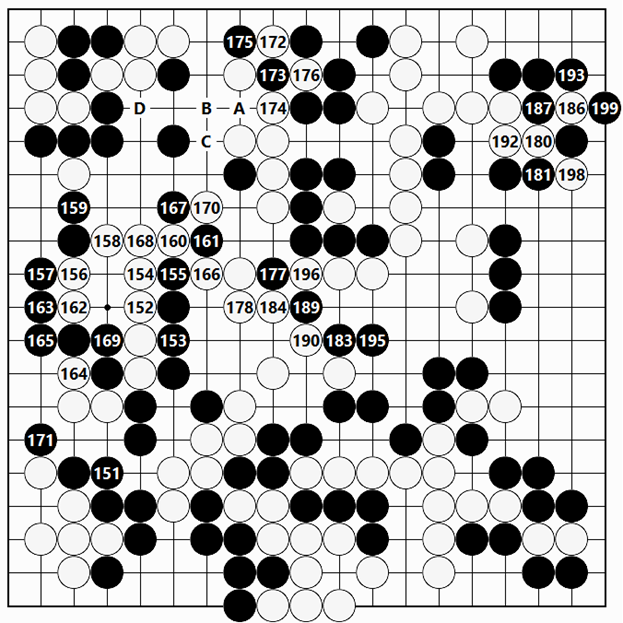 Therefore, Black set up a ko with 73 and 75. The upshot of this is a huge swap [furi-kawari] of Black’s group on the upper side for White’s position in the lower left, which is stunning. The raging battle comes to a halt at the same time. And yet, as might be expected the outlook in the game was still favorable for Black. Even subtracting the large 5 point komi, it seemed that there was a solid difference of approximately 10 points. Go 9 dan’s expression was also gloomy. From now on, the endgame was entered. It is frightening to consider that this kind of advantageous game could turn into a comeback for White through consecutive slack moves by Black that were exploited by White, little by little. Sakata 9 dan was pressed for time, down to his final 4 minutes, and in wrapping up the game his play fell apart. He must have been overly confident of his advantage, and let down his guard. For Black 25, jumping to 68 was the better way to play. Instead of Black 37, connecting two stones, too, is better played as Black 52, White A and Black 48. In this way, Black 43 becomes the losing move. 43 was the last chance to play at 52 and the sequence pointed out. Had Black played that way, although the game would be close, Black would have been slightly ahead.